I forgot to take a picture today (! ), so will use another picture I took on Wednesday (8th July) instead. You see that night, it was State of Origin night. A big deal for local sports fans. And it seems the pattern, if there’s something reasonably big happening, then the lights of many big things around Brisbane have their colours changed to represent it. 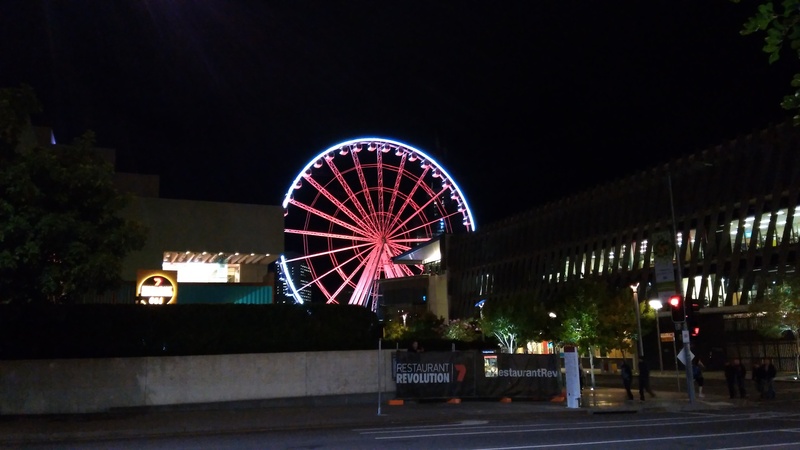 This example, of the wheel being red, is celebrating that the local sports team in this particular competition is named the Queensland Maroons. So the lights of the bridge, big buildings, and the wheel were all maroon (pronounced marown if you’re a local) tonight.